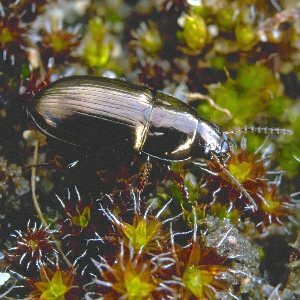 Description: A 6-9mm bright bronze ground beetle with a typical squat, oval, Amara appearance. Largely phytophagous. Found on dry sandy ground with sparse vegetation, or on bare soil in gardens, arable land, river gravels etc. Very common. World Distribution: A Eurosiberian Southern-temperate species (84) found across Europe to Macaronesia and the Mediterranean and east into western Siberia. Introduced to N. America. Irish Status: Widespread and fairly common, especially near the coast. Ecology: Mostly recorded from better-drained, open situations, but on most soil types including deep peat. Common in gardens and on sandy soils near the coast.